Disneyland truly does have appeal for kids of all ages. 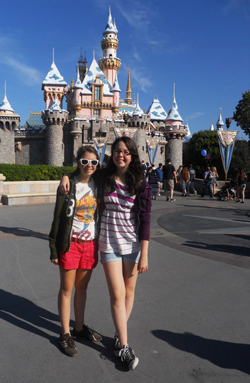 When my girls were little, they were enchanted by princesses, Sleeping Beauty’s Castle and such. On subsequent visits they graduated to the older kid rides, and now, it is roller coaster city baby. We learned a few tricks this visit that helped us avoid some of the longest lines in the park. Here are our secrets. We got to Disneyland at opening time, 8am, and walked quickly to get a fast pass for Indiana Jones, our vote for the best ride in the park (a fast pass allows its holder to return at a later time and bypass the main line for a much shorter line, or in many cases, no line at all). As soon as we got the fast pass, we went on the ride in the regular line, because there was no wait (it was 8:05 a.m., and most families weren’t even out of their hotel rooms yet!). Then we saved our fast pass to go on the ride again later in the day, when the lines got long. We also noted the time we could get a fast pass to another ride (listed at the bottom of the fast pass ticket), and as soon as we were able, we got fast passes for other popular rides. At one point in the day we had three different fast passes in our pockets. Click here for more information on fast passes at Disneyland. We also took advantage of rides that offered single rider passes. If you’re willing to ride separate from your group, you can walk to the front of the line and get right on, saving yourself anywhere from 10 to 75 minutes. In almost every case, we still rode right in front of or behind each other. Not all rides offer single rider passes, check the Disneyland map to see which currently offer this time saving option. We booked a hotel in Anaheim through Priceline.com, winning the three-star Doubletree for just $61 a night. Although Priceline only guarantees beds for two people (something to keep in mind in other cities), we’ve never had a problem getting a room for four in Anaheim, likely because most Anaheim hotel rooms are designed for families. The Doubletree even offers free parking and free shuttles every half hour to and from Disneyland—a great deal. We rented a car through Alamo for one day to visit Pomona College, a beautiful campus in the lovely town of Claremont (Can adults who already have a college diploma go back to college and not seem odd? Because I want to go to school here, not so much to study, but to take advantage of Pomona’s many offerings. The jury has ruled on this one, and the answer is no, I can’t go back to college, mostly because I can’t even afford to send my children to college, let alone myself too. I’ll just have to live vicariously through Emily.) We also took Super Shuttle from LAX to the Doubletree on our arrival. We reserved in advance online (http://www.supershuttle.com/) for $16 a person, and the ride took about 40 minutes.